Home � Disney World Vacation Planning , Walt Disney World Vacation � Planning Your Walt Disney World Vacation: How Long to Stay? Planning Your Walt Disney World Vacation: How Long to Stay? Planning a vacation can be something that some dread, while others relish. How much time you choose to take in planning your Walt Disney World Vacation is up to you. Experience shows that taking the time to do at least some basic planning can help you save money and make the most out of your vacation time at Disney World. If you are investing a significant amount of money to visit Disney World, it only makes sense to spend some time planning prior to your trip. Speaking of time....How long is the ideal Disney World Vacation? Is it better to take several short trips or one long trip? How do I decide? With 4 Disney Theme Parks, 2 Disney Water Parks, Shopping, Resorts, Swimming Pools, Golf Courses, and Recreational Activities galore there is plenty to do. So much that even with several trips it’s nearly impossible to see and do everything at the Walt Disney World Resort. At Disney World the ideal vacation length is not determined by amount of things to do like most family vacations, but rather the most economical way to visit. Typically the two elements that determine the ideal length of stay are Transportation Costs and Disney Park Tickets. Transportation costs can really add up in terms of time and money. The more expensive that it is to get yourself and your family to Disney World, the more likely that you will be taking fewer long trips versus several shorter ones. If flying is the best way to get to the Walt Disney World Resort for you and your family, it is in your best interest to schedule longer trips. Take into account which days airlines have the best rates. This can have a significant impact if you have a family of 3 or 4 or even more people to buy plane tickets for. Don't forget to include transportation costs when you are calculating how much your Disney World Vacation will cost. Disney World does very little in terms of discounting their Park Tickets. They use a tiered pricing system that rewards the visitor for making longer stays. If you are not planning on purchasing an annual pass , then shorter visits become very expensive. Park Tickets for more than 3 days (up to 10) are virtually the same price as the 3 day tickets. Since Disney Park Tickets are one of the most expensive parts of your Disney World Vacation this is a very important element to consider. A family of 4 will spend somewhere between $900 - $1000 on Disney Park Tickets whether they are visiting the Disney Parks for 3 days or 10 days during their vacation. 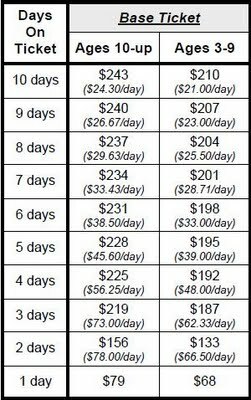 This pricing strategy was developed to most likely discourage Disney World guests from visiting the competing Orlando Florida attractions during their Disney World Vacations. The ticket pricing rewards people who are able to plan a full week vacation. If you can plan your trip to be from 6 to 8 days you are in the ideal range. Since the Disney Park Tickets are so expensive you want to get the most for your money. If you plan on a 6 to 8 day vacation, where you take a full week of vacation from work and arrive on a Saturday, you can cover a lot of ground at the Walt Disney World Resort. For people that are taking their 1st trip to Disney World or only visit once every few years, we recommend that you focus on getting the most out of your Disney Park Ticket purchase and not worry about planning many activities (that charge extra fees) outside of the 4 main parks. With one vaction you can spend one full day at each of the 4 theme parks (Magic Kingdom, Epcot, Disney's Hollywood Studios, and Disney's Animal Kingdom) and spend a 2nd day at the 2 parks that your family enjoyed the most. You will also have time to visit Downtown Disney and Disney's Boardwalk. A week will go by unbelievably fast! Once you Choose: When To Visit Disney World and How Long To Stay At Disney World, the next step is Where to Stay At Disney World which will be the next article in this planning series. So far you have picked the best time for your family to visit Disney World and have decided that from an economic perspective a vacation of around one week gives you the best deal for your money. 0 comments to "Planning Your Walt Disney World Vacation: How Long to Stay?"